Legend has it that Arjuna built this temple, to expiate for the sin of having killed Karna on the battlefield, against the dharma of killing an unarmed enemy. It is also believed that Vishnu (here) revealed the knowledge of creation to Bhrama , from whom the Madhukaitapa demons stole the Vedas. It is said that Arjuna built this temple at Nilackal near Sabarimalai. and the image was brought here in a raft made of six pieces of bamboo to this site, and hence the name Aranmula (six pieces of bamboo). There is yet another legend associated with Parthasarathy here. On the ninth dayof the battle of Kurukshetra, the Kauravas reigned supreme under the leadership of Bheeshma, when krishna motivated Arjuna to take initative and vanquish his foe. Upon his hesitating to do so, Krishna jumped down in rage, and took up his discus; seeing this sight Bheeshma surrendered to him and Arjuna beseeched him not to kill Bheeshma, as it would bave been against Krishna's vow to take up arms in his battle. It is believed that it is this image of Krishna that is enshrined here, with a discus. The malayala month of Meenam witnesses a festival where Aranmula Parthasarathy is taken in a grand procession on the garuda mount to the Pampa river bank, where an image of the Bhagawati from the nearby Punnamthode temple is brought in procession for the arattu festival. The Moolavar of this sthalam is Thirukkuralappan. He is also named as "Parthasarathy". Moolavar is found in Nindra Thirukkolam facing his thirumugham along the East direction. 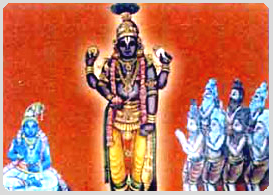 Prathyaksham for Brahma devan, Vedavyasa Maharishi. This divyadesam is found next ot Sengannoor in Kerala. 6 kms away in East from Sengannoor, this sthalam is found. We can reach this sthalam by travelling in Bus. For staying facility, a devasthana chouttry (Chattiram) is available, but food facility is minimum.